There are many ways to cook salmon. I am going to suggest one or two simple methods here to get you going. I like to cook extra when salmon is on the menu because it makes great salmon salad, like tuna salad. When you were little, the first time you have salmon salad, you came home from school and told me it was the best tuna fish sandwich you ever had. So you will like salmon as a salad, if you don’t recall. To make the salmon salad, I used Saffron Aioli, which will be the next posting for you. The easiest way for you to cook it is to start by rinsing the fish under cold water. If you have a large piece, cut it into pieces about 1″ thick, or as thick as you want your portions to be. Feel along the flesh to locate pin bones. If you find some, pull them out with needle nose pliers. 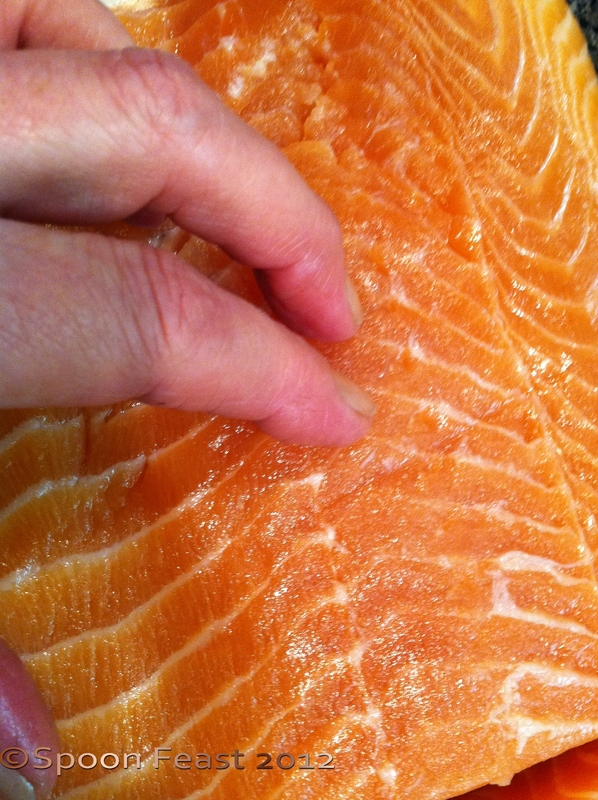 Rub your fingers over the fish to feel for any “pin bones”. Pull these out with a pair of needle nose pliers. They are hard to get out, that is why we use the pliers. If you don’t have pliers, try to pull them out with your fingers, being careful not to destroy the flesh while doing so. Be careful not to destroy the flesh as you remove the pin bones. If can be pulled apart easily. Look carefully, see how this part of the fish looks ‘damaged’? It isn’t all smooth and together like the rest of the fish. If the skin is still on, don’t try to remove it. There is a technique I will need to coach you on later and that will be done in person. The skin will be very easy to remove after the fish is cooked. Pre-heat the oven to 350°F. (When the light goes out, the oven has reached 350°F) Pre-heating the oven may take up to 5-10 minutes depending on your oven. Plan ahead. Oil an oven proof dish so the salmon won’t stick. Season the fish with at least salt and pepper. You don’t have to use much, but a pinch will make all the difference. Use your favorite. Notice the cut portion size. Season the fish with your favorite seasonings. Salt and pepper are just fine, add a squeeze of lime or lemon; drizzle with a bit of olive oil. Place a saute pan on the heat and get the pan hot. Add a small amount of oil to cover the bottom of the pan with a thin-film of oil. You can brush it on or pour it and tilt the pan to get the bottom coated. Place the salmon in the pan, top serving side down first. Sear it until it is golden brown. If the fish is ‘sticking’ to the pan, wait a minute or two. When the salmon is ready to turn, it will release on its own. Using a metal spatula with slots in it, to turn the salmon over. This tool is called a fish spatula – but it is useful for much more than fish! Place the pan in the oven to finish cooking the fish while you get the rest of the dinner ready. Total cooking time for salmon is in the general area of 10-15 minutes, depending on the thickness of the fish, the accurate temperature of the oven and how long does the salmon stay on the burner or in the oven. Only place pans in the oven that have oven proof handles! If the handles are plastic or other than metal, they cannot be put in the oven. Check your pans to see if the handles are oven proof before you put the pan in the oven. Continue to cook the fish until it is no longer raw in the center. You can eat salmon medium rare and even raw, but I would advise buying “Sushi Grade” salmon if you want to eat it less than done. Sushi grade will cost nearly double. It goes through a freezing process to kill any parasites that won’t be killed by cooking. If you want to cook some rice to go with the salmon, plan on cooking that just before you start the salmon. It will take about 20 minutes for basmati rice; 50 to 1 hour for brown and heavier grain rice. While the salmon is cooking, steam some vegetables. 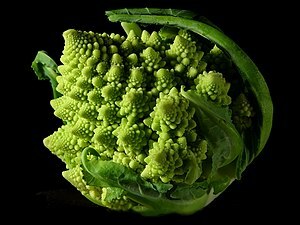 In the photo, I chose “Romanesco” which is like a green cauliflower but the florets form a very interesting logarithmic spiral growth pattern. It tastes a bit like a mix between broccoli and cauliflower. Sometimes called Romanesco broccoli or Roman cauliflower, this vegetable has been around since the 16th century. Since you like broccoli, look for this too. I am sure you will love it just as much. I like it for the wonderful oddness of it all. To me it is just a marvel! Cook it the same as you would broccoli. Another way to cook your fish is to wrap it all up in a tin foil bundle and bake it at 350°F for 10 -15 minutes; until it is done. 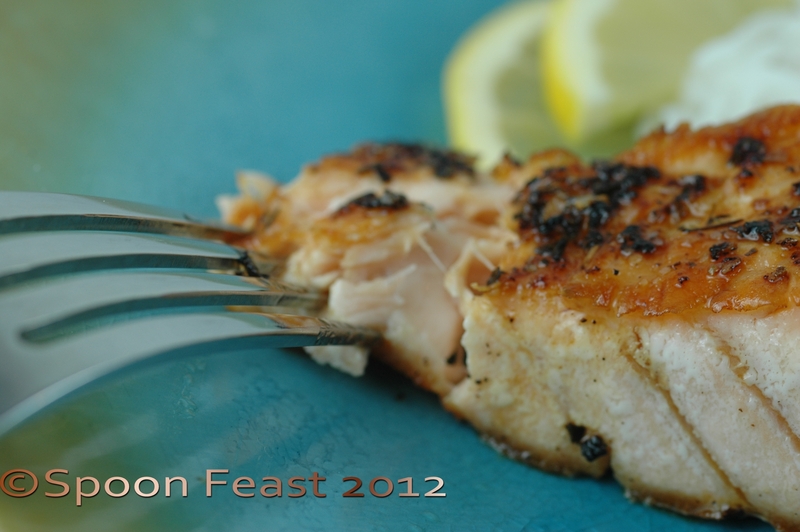 Squeeze some fresh lemon or lime juice over the salmon, plate it and gobble it all up. Place the fish on a sheet pan or oven proof dish and instead of sauteing it in a pan, simply place the dish in a pre-heated oven and cook for 10-15 minutes or until done. The fish is cooked in all cooking methods when it is no longer dark salmon color in the center, it flakes easily and it reads 145°F on an instant read thermometer. Cold salmon is delicious too. It will flake easily when done. 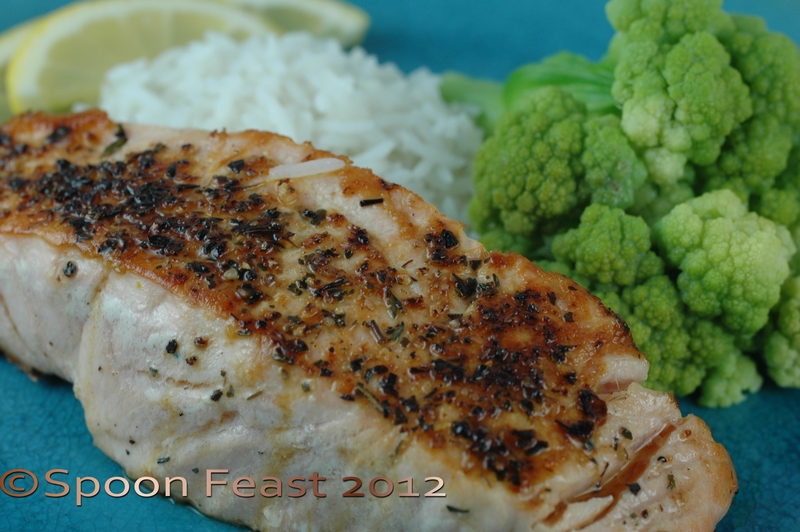 When thinking about what seasonings to choose for salmon, remember salmon has a salty profile with a tinge of sweetness. Sweet vinaigrette such as raspberry vinaigrette or honey Dijon vinaigrette make a great sauce for salmon. Mix white balsamic (or dark balsamic) vinegar with Dijon mustard, honey, salt and pepper. Add olive oil to smooth it out and use that as a sauce. Adjust quantities to taste. You don’t need to make a lot. Whisk it all together and voila! For raspberries, use melted raspberry jam (seedless) or mash some fresh or thawed frozen berries through a wire mesh strainer to get the pulp without the seeds. This entry was posted in Recipes and tagged cook, dinner, Fish, Frying pan, Olive oil, Oven, Romanesco, Salmon, ways to cook salmon. Bookmark the permalink. I recommend to cook salmon sous-vide for 30 minutes at 109 degrees. Sous-vide is great but I don’t think it is something novice cooks need to be messing with due to food safety issues. And the salmon needs to be incredibly fresh and high quality and wild caught to be really safe. I really like sous-vide in my garde kitchen but it is way too risky to be done at home by anyone who does not understand the dangers of clostridium botulinum. This is why I do not recommend the technique to novice cooks. And salmon done sous-vide is melt in your mouth good! 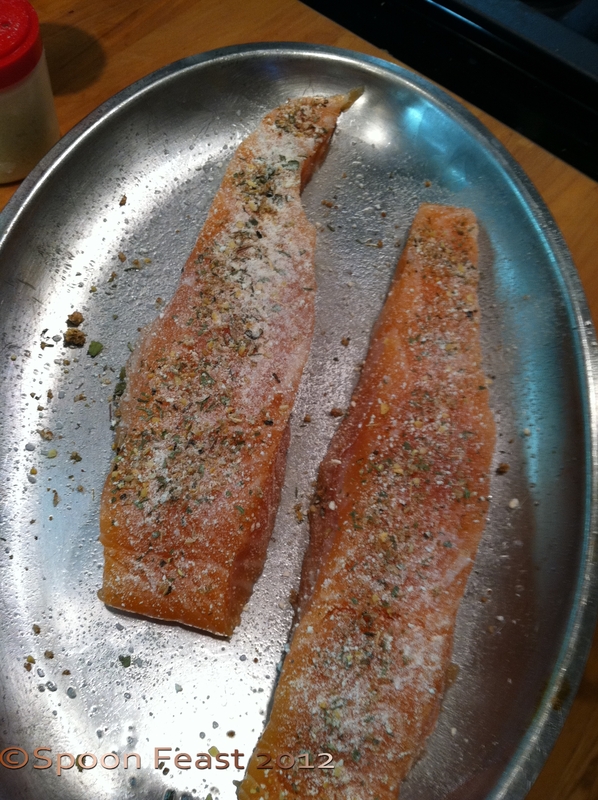 What seasonings do you use with your salmon? I agree on the melt-in-your mouth good! My favorite seasonings for salmon are Teriyaki (http://stefangourmet.com/2012/02/19/salmon-teriyaki-sous-vide/), scallions with japanese soy sauce and rice vinegar, or simply lemon, salt, and freshly ground black pepper (with perhaps a bit of dill or fennel fonds). The latter is also really good for hot smoking. I don’t think food safety is a big concern with sous-vide. Have you read what Nathan Myhrvold says about that on eGullet or in Modernist Cuisine? Botulism is only a risk if you are planning to store it in vacuum for a long time (for fish I always cook sous-vide and serve straight away). Fish that is safe from a food safety perspective (i.e. pasteurized) is not edible according to me since it will be completely dry and tasteless. You are absolutely right that that does mean that the fish should be fresh enough to be eaten raw (i.e. sushi grade). Only contaminations on the outside can be eliminated without rendering the fish inedible (i.e. by searing). What a great post for Tyler! My mom taught me to test if fish is cooked using a toothpick by first inserting the toothpick into the raw fish to feel the texture then half way through cooking and then the fish was cooked. Bit of a “feel” thing but works like a charm. Another great tutorial. I am lucky that where I buy my salmon, it has been checked and any pin bones removed. It certainly saves some prep time. Yes, it does. 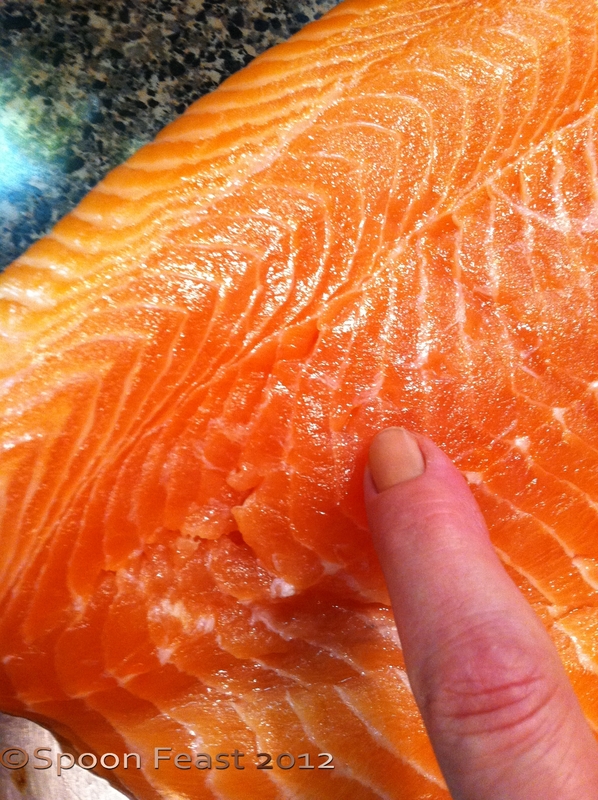 There is nothing worse than eating salmon that still has those pin bones.